NorthernAxcess brings the Inmarsat iSatphone Pro Basic Used Demo Kit that includes the basic accessories, however may or may not include the box. Our Used Demo iSatphone Pro satellite phone is one of the most budget friendly option of the Inmarsat satellite phones. All our Used Demo kits comes with the latest firmware upgrade that Inmarsat has to offer to make sure your phone is working properly. Take this kit out at sea, or remote locations and have the capability to communicate without limits. You can activate a sim card within 90 days with a prepaid plan. When purchasing this kit, you will not pay an activation fee if you choose to buy a prepaid plan. This item has been discontinued and has been replaced with the Inmarsat iSatPhone 2 Satellite Phone. This new phone has many features such as SOS button, Military top rating IP 65, GPS tracking, pageability, calls can be received with antenna stowed, and faster registration time to the satellite. Do you have an iSatphone Pro satellite phone and want to upgrade to the newest model iSatphone 2, you can send us your old isatphone pro satellite phone and will give you credit towards your new purchase. Learn more about the NorthernAxcess Buyback program. Investing in a lifesaving communication equipment such as satellite phone can be very expensive and the manufactures warranty can be limited upon certain physical damages. NorthernAxcess offers the Protection Shield Plan for the Inmarsat iSatphone satellite phone. This plan is valid for 2 years and provides free one time replacement parts such as LCD screen, microphone, battery and more; Also, includes other free services such as maintenance, cleaning and firmware upgrades, 24/7 technical support and Point of Contact Service. Learn more about our iSatphone Pro Shield Protection Plan. 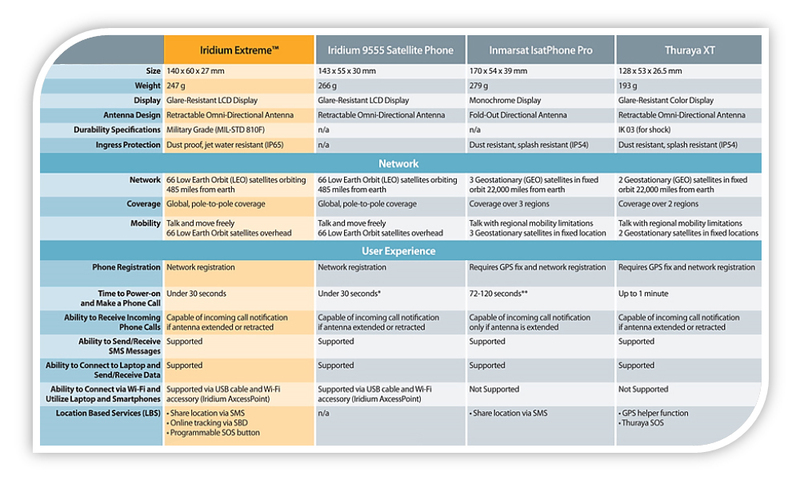 Below is the comparison chart of the most common satellite phones;This chart can help you understand better the functions, features, specifications and network registration of each of the satellite phones. Click the button below to add the Inmarsat IsatPhone Pro Satellite Phone Used Demo Kit to your wish list.